Pressure of hydrocarbons within the pores of a hydrocarbon reservoir. 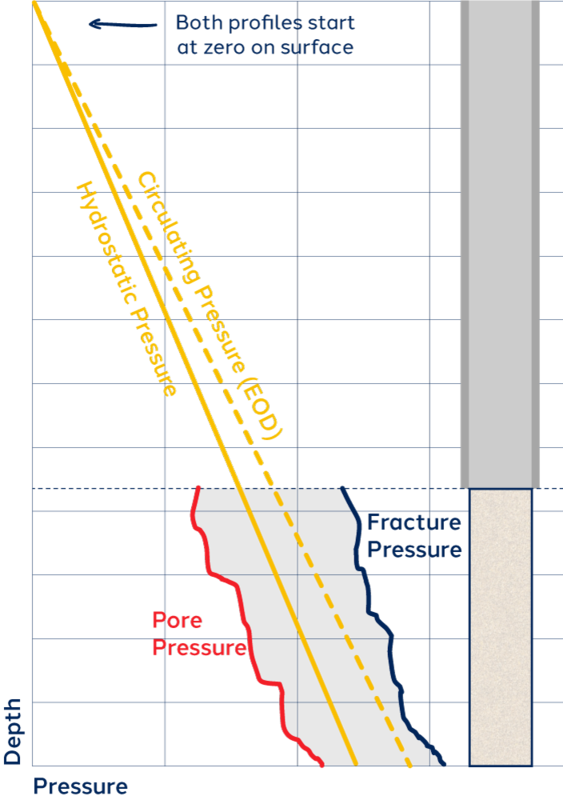 Pore Pressure is at times the hydrostatic pressure which is exerted by the water column from the depth of a hydrocarbon formation up to the sea level. Pressure at which stress-induced enlargements of the wellbore cross-section occur. When a wellbore is drilled, the material removed from the subsurface is no longer supporting the surrounding rock. As a result, the stresses become concentrated in the surrounding rock and the borehole walls can collapse into the hole. Pressure at which the formation rock will break and allow fluids to flow inside. Pressure of fluids present in a hydrocarbon reservoir. This pressure is usually exerted by a column of water on sea level from the depth of a hydrocarbon reservoir inside the earth’s surface. Source: Breakout Pressure: World Stress Map Project. All other definitions from Petropedia. 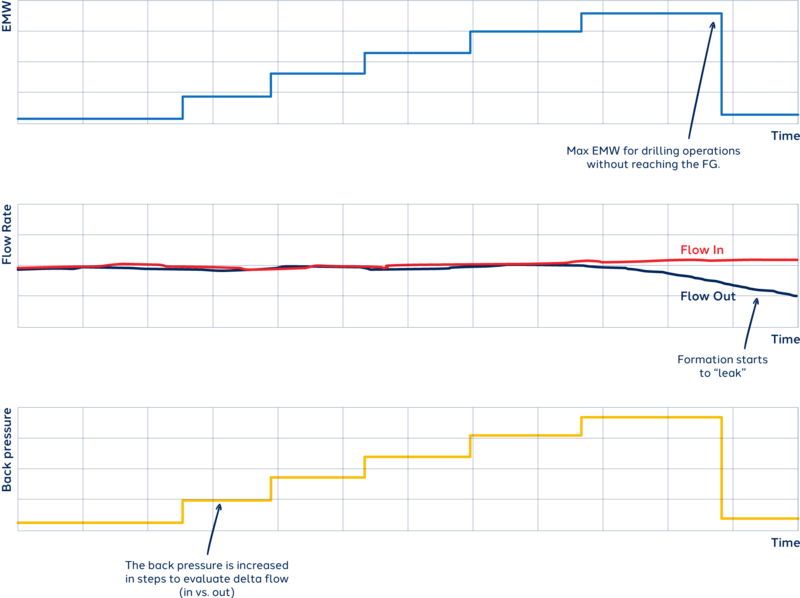 Oil and Gas wells are drilled through several formations that have different pressure trends. These three pressures define the window in which the pressure created by the drilling fluid can exist within without causing problems. Wells are designed in a way that every time the drilling window is narrowed down to almost zero, a new casing string is set. 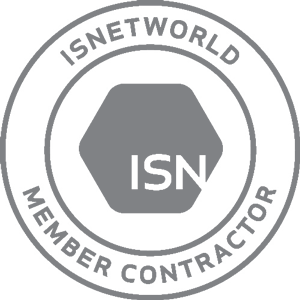 This allows drilling to target a particular group of formations at the time, where determined hydrostatic and circulating pressure profiles can be maintained as to not exceed the defined drilling window boundaries. 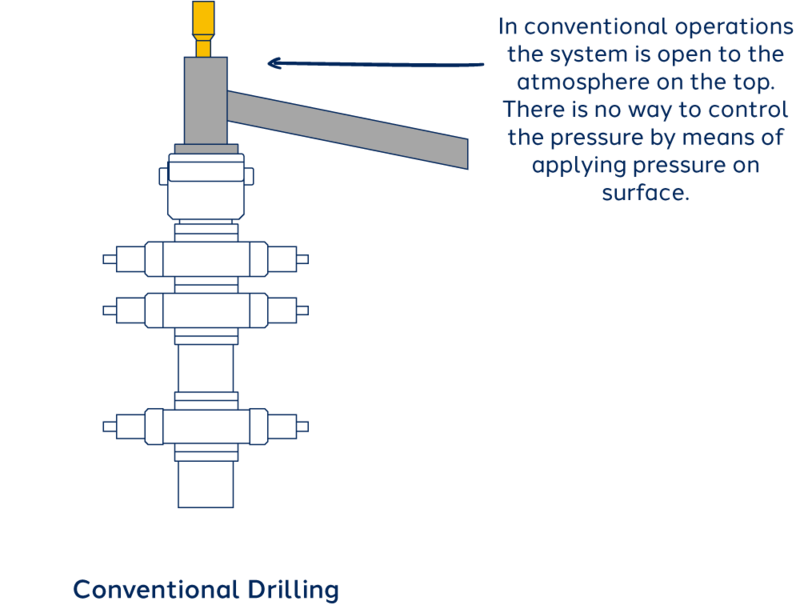 What is Managed Pressure Drilling? The International Association of Drilling Contractors (IADC) defines MPD as “adaptive drilling process used to precisely control the annular pressure profile throughout the wellbore. The objectives are to ascertain the downhole pressure environment limits and to manage the annular hydraulic pressure profile accordingly”. 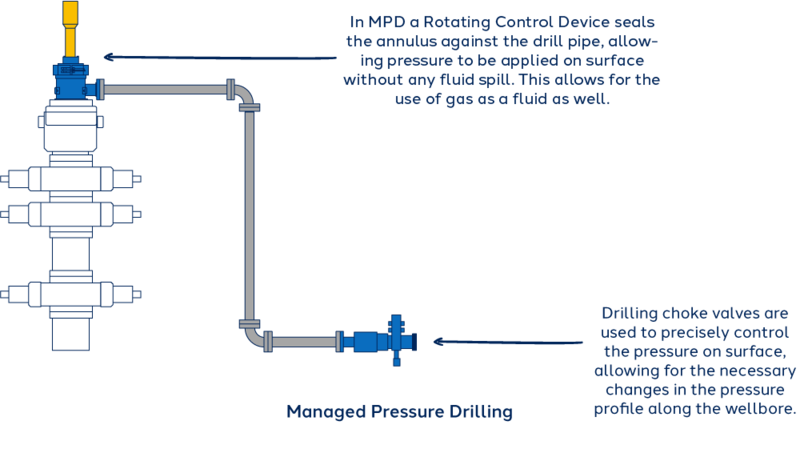 MPD is a much better and more efficient way to control the pressure profile in the well and this is possible through the use of a MPD system that creates a closed circulating system instead of the open one used in conventional operations. In conventional drilling, the well drilling system is open to the atmosphere at the top. 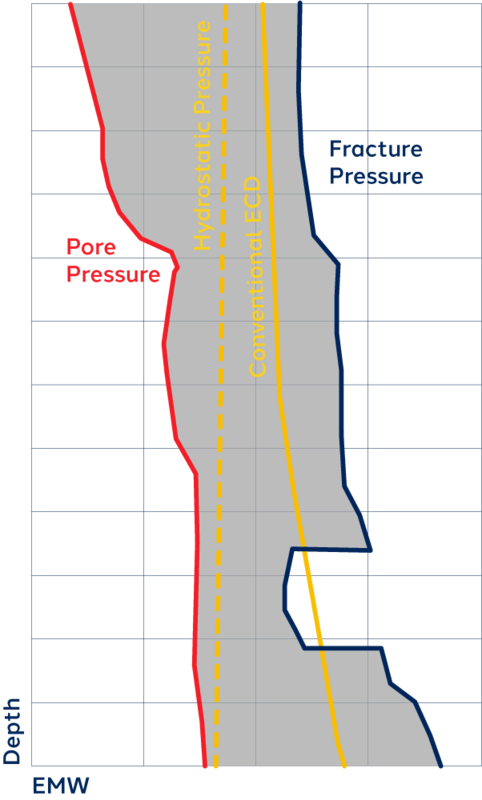 The dynamic or circulating one due to the hydrostatic pressure plus the pump pressure necessary to circulate the fluid into the wellbore (dotted line). This one is called Equivalent Circulating Pressure or ECD. 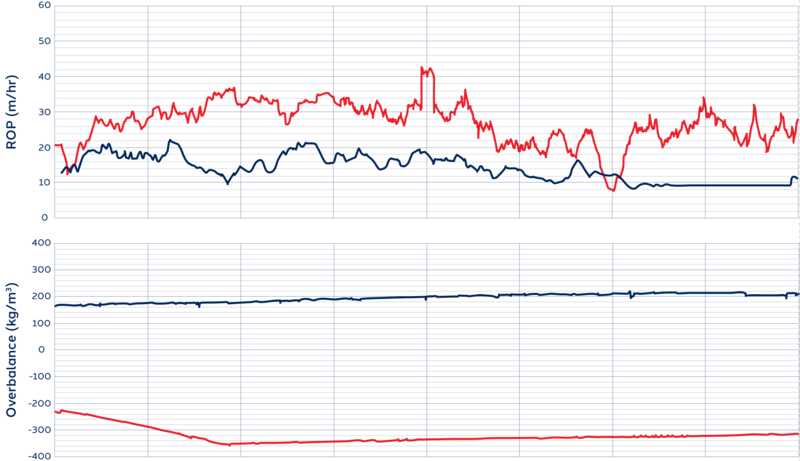 One of the limitations of an open system is that the pressure profile always starts at zero at surface. MPD enables the driller to adjust the surface pressure in order to fit the drilling annulus pressure profile within the drilling window. This allows the drilling of wells that would otherwise be undrillable, as we will see on Part II. 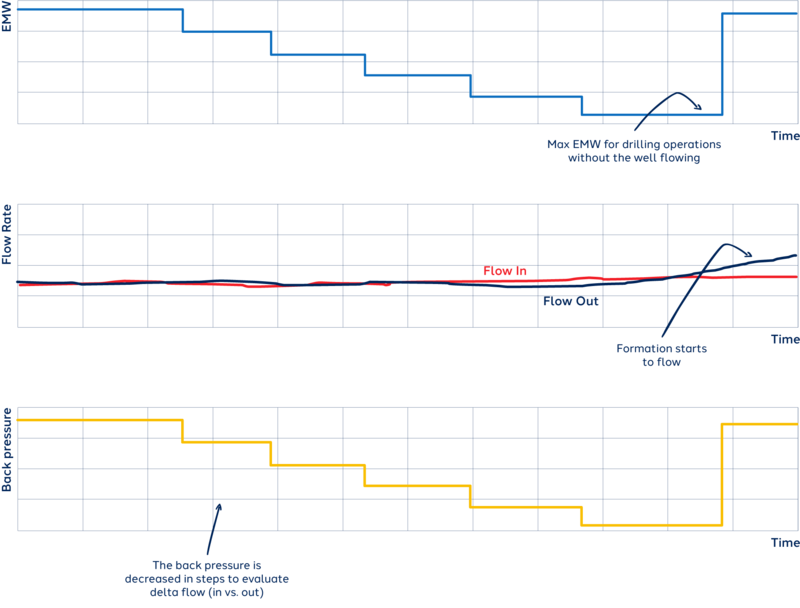 The conventional hydrostatic pressure is no longer a constraint as some pressure can be applied on surface to add to the bottom hole pressure, creating a different profile when pumps are off called Equivalent Static Density (ESD). With narrow mud weight windows, the difference between the hydrostatic and the ECD (pumps off and pumps on periods) is greater than the drilling window, making it impossible to drill the well without experiencing losses or influxes. Depleted formations can cause a sudden loss of circulation situation, making it almost impossible to drill at the current ECD. 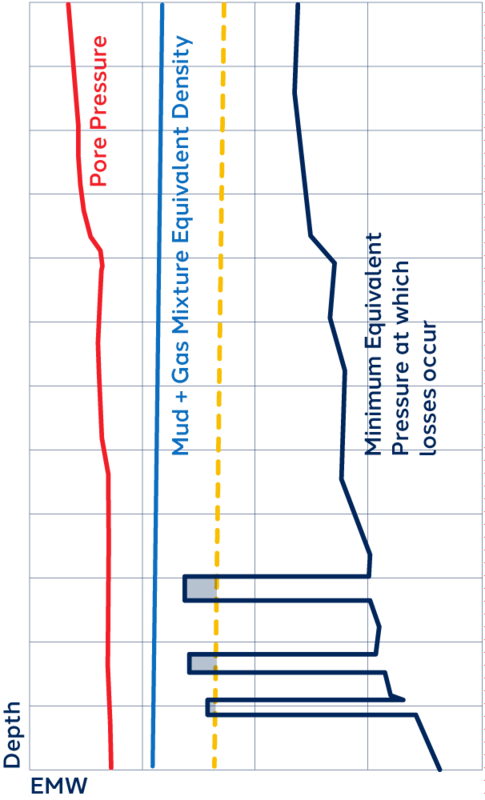 If the mud density cannot be decreased further due to limitations on the lower boundary (pore pressure) then a narrow drilling window situation is created, resulting in a program that is very difficult to control and to see to completion using traditional drilling techniques. One solution to this problem could be to set another casing string but this is not only more expensive than applied pressure-control techniques such as MPD but will also change the well geometry and may not solve the narrow drilling window problem. 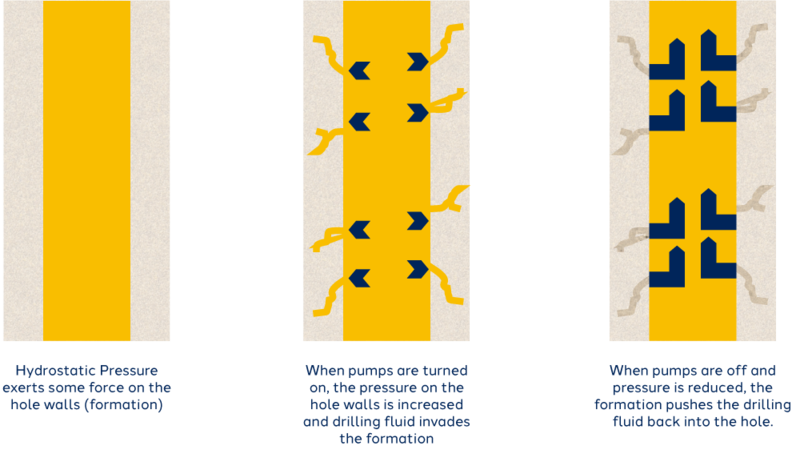 MPD offers the option of stripping with pressure on surface to overcome the swab effect. This avoids the need of changing mud properties or more time consuming operations. 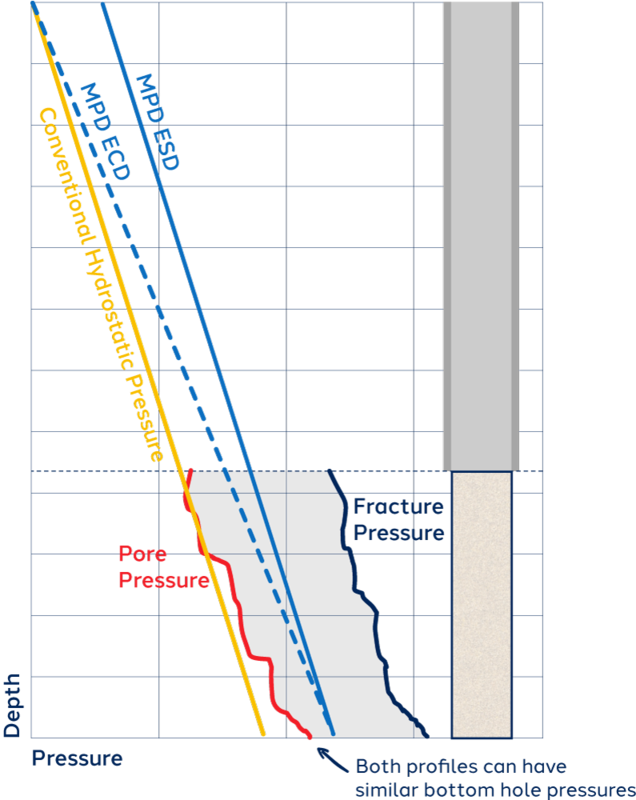 Even in long horizontal wells that exhibit a relatively normal drilling window, the fact that friction losses increase as the well is drilled deeper can create a scenario where the ECD can easily exceed the fracture pressure, making it impossible to drill the well to the planned horizontal section length without experiencing loss of circulation. One solution to this problem is the use of MPD systems with hydrostatically underbalance drilling fluids to be able to decrease the ECD to a point that will allow the well to be drilled to the planned depth without experiencing loss of circulation. Some formations are sensitive to pressures changes. The change in pressure between pumps on and off periods can be enough to induce some degree of instability in the formation that can lead to several problems during drilling, from cavings falling into the hole to stuck pipe events. 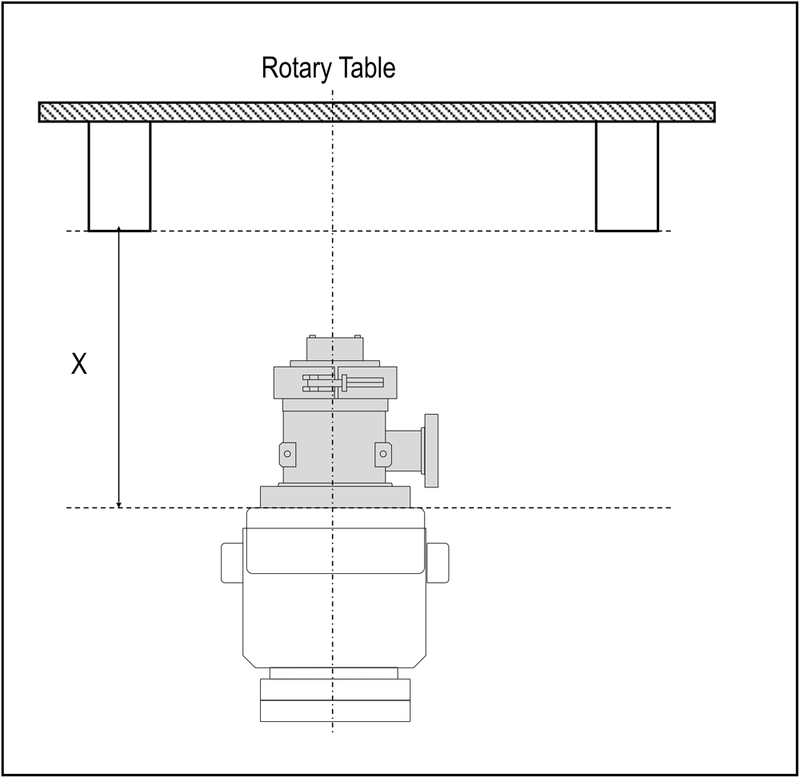 Applying the constant bottom hole pressure technique with MPD systems can help overcoming this problem in those pressure sensitive formations. 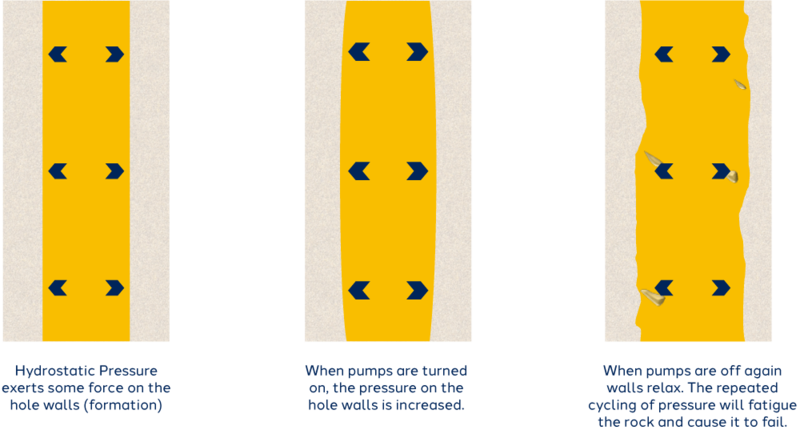 In some cases, when higher pressures are exerted over a formation (e.g. when pumps are on), the formation takes some fluid into the natural formation fractures/pores. This effect is commonly referred to as Ballooning and it can be very challenging for drillers if not fingerprinted properly. The main danger with ballooning is to be confused with actual influxes. As drillers are not sure whether the well flowing during a connection is ballooning or an actual well influx, the usual response is to increase the mud density which in turn, leads to a stronger ballooning effect and the cycle is repeated until the mud density is so high that it leads to loss of circulation and also borehole breakout/collapse. Again, applying the constant bottom hole pressure technique with MPD systems can help overcoming the ballooning problem in these formations. Similar to the case of narrow mud weight windows, a hydrostatically underbalanced mud can be used to reduce the overbalance during dynamic periods. In wells with uncertain fracture pressures, MPD enables the user to assess the fracture gradient by performing Dynamic Formation Integrity Tests or Formation Leak-Off Tests. These tests are possible due to accurate measurement of flow out using a Coriolis Flow Meter in the MPD system. The difference between the flow in and flow out measurements allows for faster evaluations to determine if the well is taking on fluid. 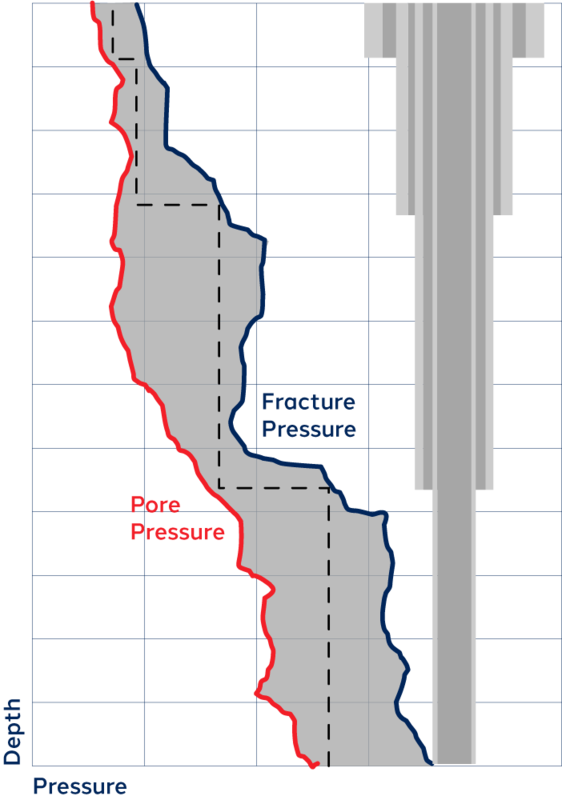 In wells with uncertain pore pressures, MPD enables to assess the fracture gradient by performing Dynamic Flow Checks. The difference between the flow in and flow out measurements allows to evaluate when the well is starting to produce fluids. 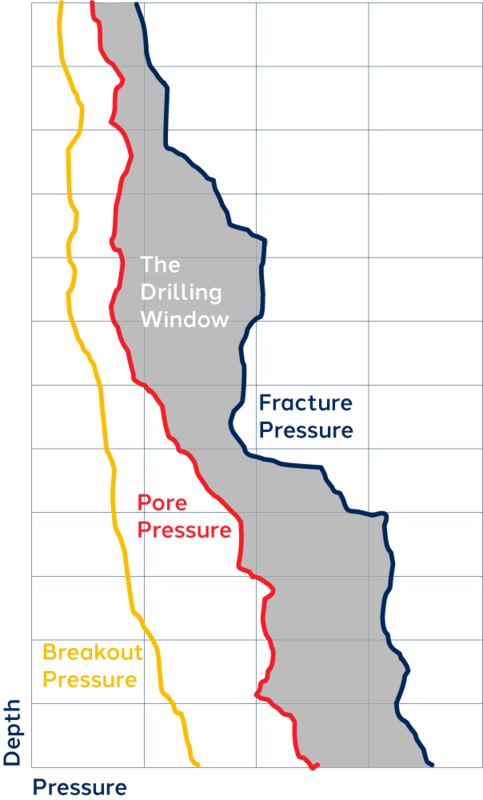 Some wells with over-pressurized fractures or “reservoir pockets” can create a narrow drilling window condition as seen on this chart. 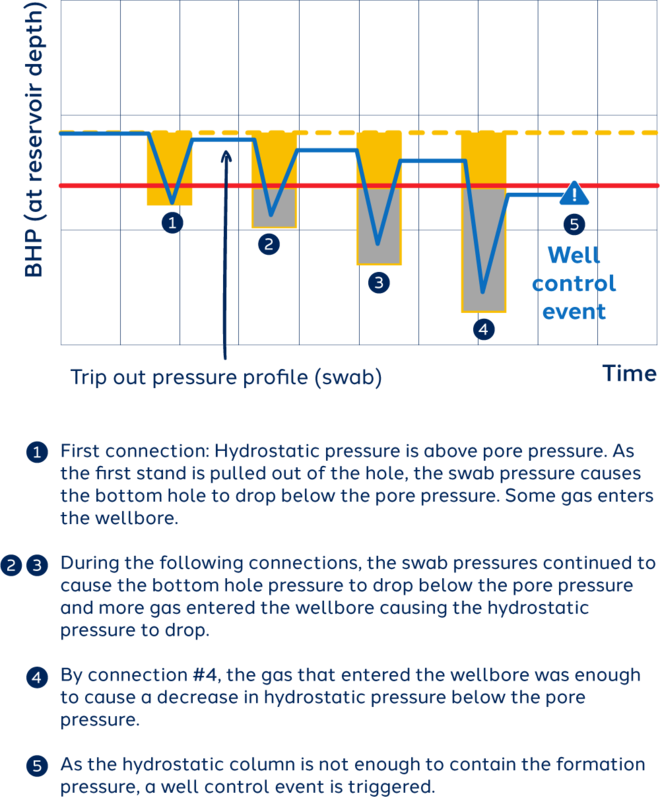 If the amount of gas to be produced to bring the pore pressure down to normal values is relatively limited, the well can be produced while drilling until a normal drilling window is restored. In conventional applications this would mean that the drilling operation has to be stopped and the well flowed sometimes for several days, adding up to drilling costs. With MPD, since the closed system allows drilling while flowing (flow drilling), the well can still be depleted as the drilling operation continues, saving the customer days of rig time. The savings are substantial, especially if several over-pressurized fractures can be encountered while drilling the well. 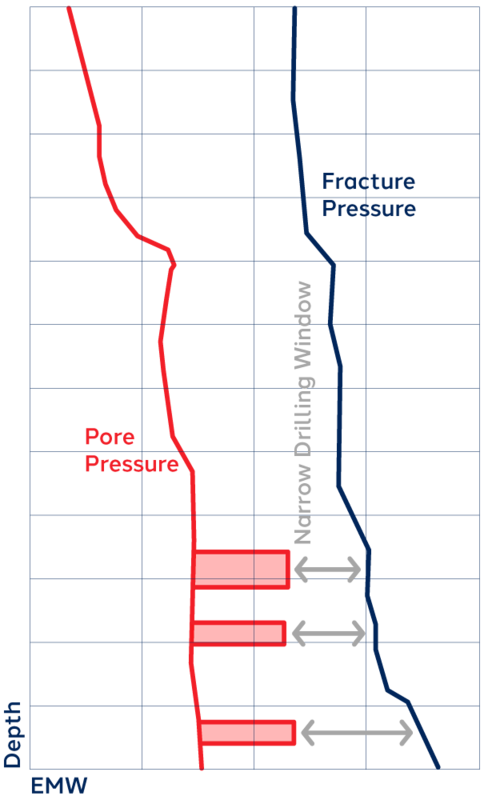 In sub-normal gradient wells or severely depleted formations, the equivalent pressure at which losses occur is below the hydrostatic pressure of the lightest mud possible (usually a base oil or produced crude fluid). These type of formations cannot be drilled using conventional techniques as there is no way to have full returns of drilling fluid on surface. As MPD offers a closed system and separation capabilities, a service gas (usually nitrogen) is incorporated into the drilling fluid system to lighten the equivalent density and allow for full returns on surface. 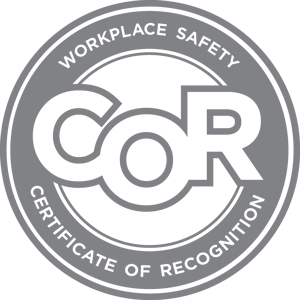 There is additional equipment necessary for this operation to allow for service gas to be injected and this needs to be reviewed and incorporated into the P&ID.